Here are the occasional reflections of a joyful traveller along the strange pathways of fantasy and adventure. All my reviews are independent and unsolicited. Here you will find only recommendations, never negative reviews. If I read a book which I feel is less than wonderful (which happens far more often than not) then I simply don't write about it. This blog is, rather, a celebration of the most exciting books I stumble across on my meandering reading journey, and of the important, life-affirming experiences they offer. It is but a very small thank you for the wonderful gifts their writers give. A warm welcome to a new independent Scottish publisher, Cranachan. They are introducing an imprint called 'Pokey Hat' (a colloquial term for an ice cream cone, I understand) which will publish historical fiction for children 9-12, with an emphasis on Scottish authorship and/or content. Valuable contributions are already being made in this area by a established imprint, 'Kelpies' from Floris Books, albeit in a wider range of genres. However competition is always welcome. In any case this is hardly an overcrowded field. And, certainly, if this first title I have read is anything to go by, 'Pokey Hat' is set to provide some most valuable and enjoyable additions to the canon. Of course there is a fine tradition of children's historical fiction going back to the incomparable Rosemary Sutcliff and beyond, and this is not without 'classic' Scottish examples like Kathleen Fidler's The Boy with the Bronze Axe and Mollie Hunter's The Stronghold* which most certainly deserve to be read by a new generation of children. 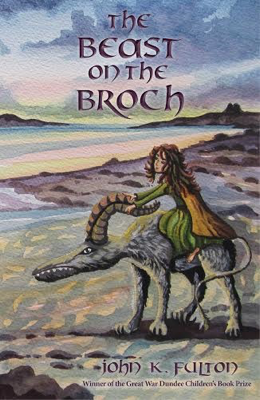 The Beast on the Broch is almost, but not quite, straight historical fiction in the same mould. However, here, an intriguing, and in this case charming, element of fantasy is added in that the eponymous creature belongs to legend rather than history, and yet has an actual, physical presence in the story. John Fulton's skilful use of language is clear and accessible, yet pertinently evocative, which makes this a good 'entry level' to the genre for its intended audience. It will I'm sure help to bring many new young readers to enjoying historical fiction, as well as hugely pleasing those already hooked. It does extremely well what all good historical fiction must, that is to say it creates a convincing, well-researched social context and explains a good deal of the 'political' background, in ways which are totally and comfortably integrated into the narrative, rather than imposed upon it. The period of Scottish history reimagined here (around 800 AD) is a most interesting and, to me at least, relatively unknown one. However, more than this, the story told within it is an involving and, in its later stages particularly, a grippingly exciting one. Added to this is the frisson of fantasy provided by the actual presence of the 'beast'. This is beautifully described to fit in with that depicted in genuine stone engravings found from the Pictish culture. Drawing on both history and legend proves a strong way of illuminating what is often a 'dark' period of history and the author certainly brings it vividly to life. However the close relationship between protagonist, twelve year old Talorca, and the beast is really, as much as anything, a classic, heart-tugging child-and-companion-animal scenario, which will only add to the appeal of this story for its intended readership. Imagine if you can Wolf Brother, but with a feisty girl instead of Torak, a beast instead of a wolf and a setting in 'Dark Age' Scotland rather than prehistory. Yet what makes this book particularly fine is not simply its historical interest, or the driving excitement of its storyline. Within these lie a strong, complex character development and the exploration of some most important issues. As the narrative evolves, questions begin to arise about Talorca's actions and motives; whilst understandable these may not necessarily always be 'right'. She has much to learn about life and its living, some, but not all, of which she has realised by the end. Many readers may unobtrusively learn something alongside her too. Stories have, throughout time, been used as a way of teaching, organically rather than didactically. Their great power lies in the way that they can speak to the heart as much as to the head. And this one is no exception. It may be going too far too see it as an allegory of our own world. However the conflict between resentment and acceptance of new 'immigrants' into her community, which lies at the heart of Talorca's dilemma, together with the need to unite against larger, life-taking threats from further 'outside', gives young readers a great deal to think about. And maybe they will make more connections than we think, implicitly if not explicitly. I appreciate that many Scottish people, regardless of their stand on independence, will wish to help their children appreciate the very special and particular heritage of their homeland. Similarly, their children need the opportunity to identify with stories which directly relate to their own background. It is equally important, however, that children outside Scotland also have the opportunity to come to know and value something of the the history and culture of this unique, special and, in many places, unspeakably beautiful country (midges apart). This fine book will, I'm sure, contribute significantly on all these fronts, as well as giving many children a hugely enjoyable and entertaining read. It could well end up helping to grow their humanity too. *Which, incidentally, imaginatively fills in a story of the origins of the Brochs, a ruined example of which features in John Fulton's tale. Dedicated to all those who wish to encourage a love of reading in children and young people. Use the LIST PAGES below to see all my recommendations and find out where to access them in the BLOG ARCHIVE.